Come see NC ABANA Blacksmiths at the NC State Fair. NC ABANA members continuously demonstrate blacksmithing at the blacksmith shop in Heritage Village at the NC State Fair. Stop by see blacksmiths at work and then visit the retail area where you can purchase a wide veriety of items made by our members. A portion of all sales at the blacksmith shop go to support NC ABANA and blacksmithing in NC. 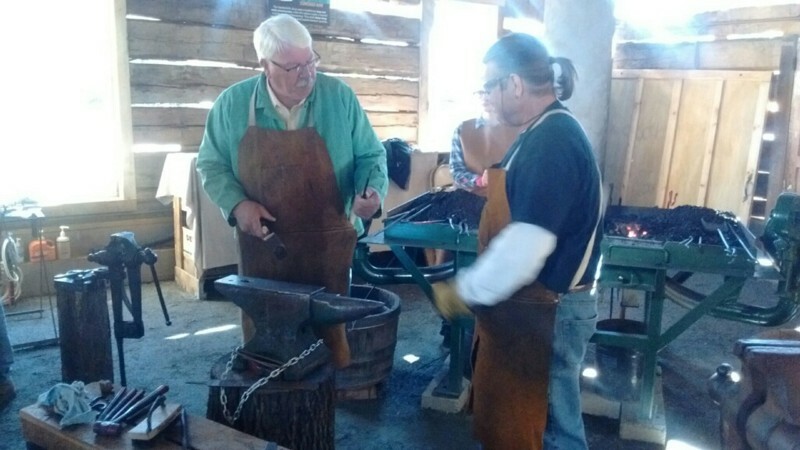 Photo above: NC Agricultural Commissioner Steve Troxler and NC ABANAs Tom Watkins forging at the 2016 NC State Fair in the new Heritage Village blacksmiths shop. State wide meetings start at 9 AM unless otherwise noted. The meetings normally start with a morning demonstraton, followed by lunch and Iron - in - the - Hat Raffles of donated items. After lunch any NC Abana business or news will be discussed and then the afternoon demonstration. Additionally throughout the day there are tailgate sales by members and vendors. Lunch is usually served onsite for a small fee. In addition to the state wide meetings regional groups accross the state have local meetings. Select this link Regional Meeting Schedules to see the contact information for the regional group and the local meeting schedule.